A positive, high-energy gathering that affirms a sense of stewardship and community pride for the Spokane River. The preservation and restoration of the Spokane River is part of the Lands Council's commitment to the forests, water, and wildlife of our region. The Riverkeeper, with its much smaller budget and staff, is the only organization in the region whose sole mission is clean-up and protection of the Spokane River. These neighboring organizations often come together to leverage their shared passion for the amazing resource flowing through the heart of downtown. The Riverkeeper is small, with only one and a half employees in a shared space in the Community Building. They do frequent sweeps and cleanups as part of their mission, according to Jule Schultz, who with a group of interns picked up 3 boatloads of junk - discarded clothing, 5 bicycles and 3 abandoned camps - just last week. 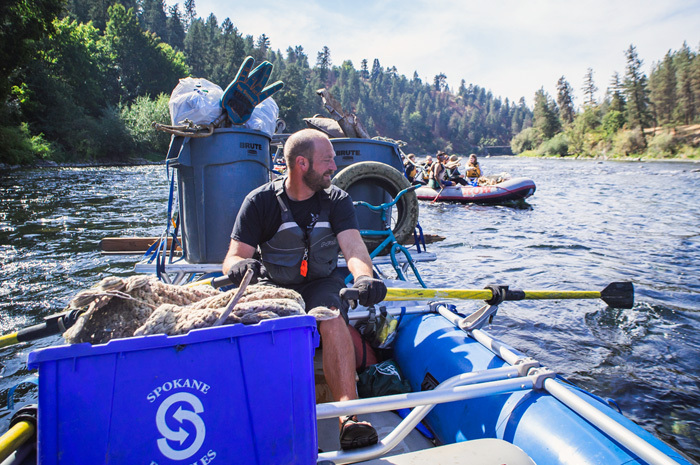 In a monumental citywide effort that involves hundreds of volunteers, the Spokane Riverkeeper manages to clear out several tons of junk from the city’s water artery in just one morning. How do they do it? Among other things, they partner with the Lands Council, next door in the Saranac, to organize the annual fall river clean-up. A coalition of 18 organizations work together on the event, which will be September 15th this year, and is expected to attract over 600 volunteers who routinely collect more than 4 tons of trash in a matter of hours. They cover banks, trails, and the waterway in Spokane Valley, the University District, the Downtown River Gorge area, and Riverside State Park. The Lands Council brings a full staff and organizational expertise to the event. They handle publicity, facilitate meetings, recruit volunteers and sponsors, provide food, water, maps and supplies for volunteers, and generally make it happen on a grand scale. The Riverkeeper deploys rafts and specially trained volunteers to go around and pick up all the assorted junk - like car bumpers - that cannot be taken out any other way. The Riverkeeper is in close touch with the river all year long, keeping tabs on its flow and wildlife and general state of health. Consequently, the staff has an intimate knowledge of what areas are most in need of cleanup and how to access them. They act as the crucial advance team for all the volunteers, and as the ones tasked with getting the stuff up and off the river to proper disposal. "It’s a win-win for everyone involved,"
Schultz says the happenstance encounters between staff in and around the block have the effect of greatly increasing the probability that collaborations like the Spokane River Cleanup event occur. Schultz says it’s like a modern day golf course. “I run into fellow river lovers every day - eating lunch at the Main Market Co-op, walking down the sidewalk, crossing the street, shopping at Kizuri - and we chat.” Schultz says these short, informal meetings are fun, and people usually ending up exchanging info, setting up more formal meetings, or just making a plan to get down on the water together.